Alex Cross’s Trial by James Patterson and Richard DiLallo is a book within a book in which the introduction is written by the character Alex Cross and sets up the impending story of his ancestors. Abraham Cross lives in Eudora, Miss., and he helps the narrator, Attorney Ben Corbett uncover the truth behind the alleged lynchings in Mississippi and the rest of the South and to collect evidence for President Theodore Roosevelt. “On the front lawn two adorable white children in a little pink-painted cart were driving a pony in circles. On the wide front veranda I could see the children’s mother observing their play and a small army of black servants hovering there. Ben Corbett is a progressive attorney who moved from Eudora, Miss., joined the military, became an attorney at Harvard University, and moved to Washington, D.C., with his young wife and twin girls. He’s asked by Roosevelt to investigate the lynchings in the South and bring back evidence so that he can deal with the problem. Patterson and DiLallo offer up an authentic step back in time for this mystery, with appearances by W.E.B. Dubois and other historical figures. Alex Cross’s Trial is a well-written off-the-beaten path novel in the Alex Cross series. Abraham Cross, a former baseball player with the Philadelphia Pythians, is an unassuming Black man living in the South, who has struggled against racism, but is willing to stake his life to make a real change in the nation. Readers will enjoy the quick page of the novel, the historical setting, and examination of issues that still exist today. Patterson and DiLallo have done a fantastic job in making a unique addition to the Alex Cross series. For a couple takes on Cross Country, visit my mom’s review and my review. Also take a look at Washington, D.C., and my Alex Cross poem. 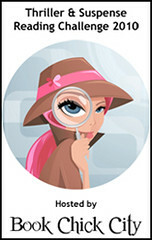 Check out the other bloggers posting for Detectives Around the World Week. Thanks to Hachette Books for sending me a free copy of Alex Cross’s Trial to review. What has been your favorite post during the week and why? Those who do not answer the question will not be entered, and I will select a random winner for the three latest Alex Cross novels, Cross Country, Alex Cross’s Trial, and I, Alex Cross through Randomizer. Deadline is May 2, 2010, at 11:59 PM EST. Please also stop by today’s National Poetry Month Blog Tour stop at She Is Too Fond of Books and A Circle of Books. This is my 6th book for the 2010 Thriller & Suspense Reading Challenge. James Patterson’s Cross Country is full of action, conspiracies, and danger. Detective Dr. Alex Cross is called to the scene of a horrific murder of an entire family when Cross realizes that Ellie Cox was his first love in college. Her death and that of her family tug at his heartstrings and strengthen his resolve to find her killers. As he investigates the crime, he discovers a gang of boys led by a man calling himself the Tiger is behind the murders and much more. Through short chapters and quick action scenes, Patterson builds the tension in Cross Country, leaving readers on the edge of their chairs as Cross hunts down another vile criminal who recruits boys as young as ten who have been orphaned in a number of African nations to become killers. Traveling to Nigeria, where it is clear Cross has not seen as much horror as he thought he had, the detective lands in hot water with local police and a swath of criminals. Patterson is an excellent story teller, and Cross Country has more violence in it than the previous Cross novels. Readers may be disturbed by the sexual violence and blatant murders committed by the criminals in this novel. Additionally, the resolution of this novel comes about more because of luck or circumstance than because of Dr. Cross’s deductive skills, which readers traditionally look forward to in these novels. However, those looking for a great police procedural with a mix of nearly impossible overseas intrigue, Cross Country is for them. For another take on Cross Country, visit my mom’s review. Also take a look at Washington, D.C., and my Alex Cross poem. Check out the other bloggers posting for Detectives Around the World Week. Thanks to Hachette Books for providing me with a free review copy. Also don’t forget about today’s stops on the National Poetry Month Blog Tour at the life (and lies) of an inanimate flying object, her giveaway, and Evelyn Alfred. This is my 5th book for the 2010 Thriller & Suspense Reading Challenge. James Patterson‘s detective series featuring Alex Cross is set in the hub of government and intrigue — Washington, D.C. I’ve lived in the area for nearly 10 years, and the most anyone ever sees of the city is The National Mall and the Smithsonian museums. Alex Cross sees the underbelly of city as a cop, but he also enjoys his community near his home on 5th St. SE. His kids have attended the Sojourner Truth School, and he volunteers at St. Anthony’s Soup Kitchen, which I believe is mirrored on a number of soup kitchens in the area. 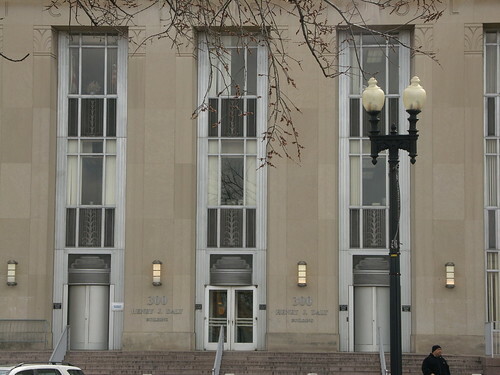 When multiple homicides occur, Cross often is briefed at the Metropolitan Police Department headquarters in the Henry J. Daly Building, which was named after Sgt. Henry “Hank” Daly. He also often runs into the FBI at Quantico and elsewhere. Cross has crisscrossed the United States a number of times, but now he’s even traversed the ocean. In Cross Country, Cross leaves his home base to catch a serial killer in Lagos, Nigeria the hub of corruption and crime. Information is traded for American dollars or other currency in market stalls. Meanwhile, a corridor exists between Nigeria and Sierra Leone where diamonds are traded for oil and gas — at least in Cross’s world. 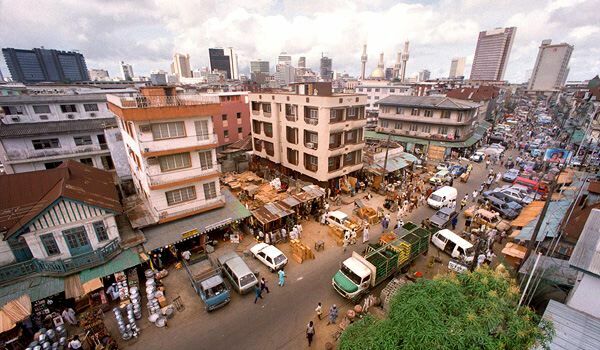 Check out the Getty Image below of Lagos. 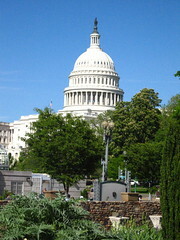 After reading a number of these novels, I think Washington, D.C., is an excellent location to have as a home base. The city has a high crime rate and is the home of espionage and more, but in Cross Country, Cross experiences a few African nations that are even more horrifying and lawless. I’m going to leave you with a little interview from James Patterson, and you can look forward to my review of Cross Country tomorrow. Also, check out the other bloggers for Detectives Around the World Week. Don’t forget about the next stops on the National Poetry Month Blog tour at KCBooks and Author Amok. If you missed me on That’s How I Blog with Nicole of Linus’s Blanket, I’ve got a treat for you . . . just listen below. I hope you’re enjoying Detectives Around the World week hosted by Jen’s Book Thoughts. If you missed my poem about Alex Cross, feel free to check it out. Today, we have a special guest, Author Cara Black who has a vivid mystery series set in Paris, France. Please give her a warm welcome; she’s a lovely woman, whom I had a chance to chat with briefly at Book Expo America in 2009. I think a crime novel is the perfect genre to explore the darker side of the City of Light. To visit off the beaten track Paris, not the beret and baguette stereotype. In writing my Aimée Leduc Investigation series, I go to Paris to research. Over the years I’ve built up contacts, nourished by wine and meals in bistros, with several of the city’s private detectives and police chiefs. My contacts have enabled me to build my stories, one for each arrondissement in Paris and ten books so far, with inspiration from real-life cases. 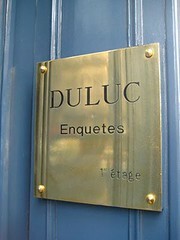 Leduc Detective (Aimée, my protagonist’s Detective agency) is indeed based on the real Duluc Detective agency. This happened one day years ago when I was at the bus stop on Rue du Louvre. 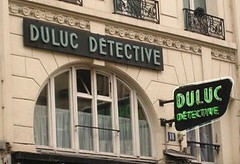 Across from me on the street was the wonderful neon thirties sign of Duluc and I’d been interviewing female detectives in Paris and thought why not this agency? I crossed the street, met Madame Duluc who inherited this agency from her father who himself had inherited it from his grandfather who’d started in the Suréte. She was very gracious and told me the history, the cases they work on and much more. I used the agency as a template for Leduc Detective; Aimée had a grandfather who’d started the agency and went from there. But when my publisher suggested we use another name for legal reasons I agreed. I’ve loved Georges Simenon’s Inspector Maigret and Leo Malet’s Detective Nestor Burma series for a long time. I wanted to see something contemporary set in Paris and wasn’t finding it. Though I’m not French I grew up in a Francophile family in California, my father loved good food and wine, my uncle had studied painting under Georges Braques in the 50’s and life in our house was very much of French appreciation. I went to a Catholic school with French nuns who taught us archaic French and felt a bond, some strange familiarity with all things French as I grew up. That’s partly why Aimée Leduc, my detective is half-American half-French because I knew I couldn’t write as a French woman. I can’t even tie my scarf properly. People ask me why write about Paris? The history maybe? For me, that’s a big part. My research gives me the chance and a nice excuse to go to Paris and scratch the surface. Dig deep and deeper to understand the quartier, the people who live there, the origins of the quartier such as Bastille with its old furniture making and artisanal roots. Paris holds so many secrets and stories that I want to keep discovering. For me it’s about the place in Paris; capturing the ambiance, the streets, the rhythm and the flavor that makes it unique. Each part of Paris was once a village and that’s what I’m looking for. I talk with cafe owners, police, people at the Archives, research photos at the Carnavalet museum, take people out for wine and get them to talk. Talk about growing up in the district, or their mother who was born there. I’ve joined the Marais historic society and the Historic society of the 10th arrondissement and met people who share so kindly with me about the place, the way the things are and used to be. Often I’ve gotten lost and that’s the best because then I discover a corner of Paris, an alley, a place I’ve never been before and that becomes part of a book. Thanks, Cara, for sharing your research, your reverence for Paris, and your inspiration. Please check out the rest of the festivities this week, here and the schedule at Jen’s Book Thoughts. Also, don’t forget about today’s tour stops for the National Poetry Month blog tour at SMS Book Reviews and Author Ru Freeman’s blog. I agree months ago to be a part of the Detectives Around the World Week, sponsored by Jen of Jen’s Book Thoughts. It runs between April 11 through April 17. Don’t forget to go an vote for the best detective in the world, and check out the complete schedule. For my part, I’ll be sharing a bit about Alex Cross with you from James Patterson‘s long-running series of novels. You may have heard of Alex Cross if you’ve watched the movies Along Came a Spider and Kiss the Girls with Morgan Freeman. LOVED THOSE MOVIES AND FREEMAN IS ALEX CROSS — at least in my mind. Alex Cross is in his fifties and has lived on Fifth Street in southeast Washington, D.C., for a long time and has been a detective on the D.C. police force as well as a psychologist and FBI Senior Agent. His partner on the D.C. force is a giant man named Sampson, and his current main squeeze is Bree Stone. Cross is a busy man professionally and personally, particularly being a single father to Damon, Jannie, and little Alex and living with his feisty grandmother, Nana Mama. As part of my introduction, I thought I would spice up the detective week with a National Poetry Month twist. at his side and the boxing fists. ready to take on the criminally insane. even as life goes on. I hope you have a great week checking out all the wonderful detectives from across the globe. My selection just happens to be from my part of the world, and what better place to have a detective than the hub of government. Jen at Jen’s Book Thoughts is hosting Detectives Around the World between April 11 and April 17 (mark your calendars), and as part of the fun, she’s holding the World’s Favorite Detective Tournament. First, I wanted to let you know that I am excited to be one of the many participating bloggers in this event and that I am psyched about my detective — Dr. Alex Cross, a Washington D.C. cop, psychologist, and FBI agent created by James Patterson. Each of us will be reviewing one book featuring our chosen detective and providing one post on setting. Guest posts and other fun activities, including a scavenger hunt, are being planned as well. There is still time to participate, Jen is accepting other blogger participants through March 28. All you have to do is email her your top three detective picks (who have to be cops, FBI, licensed PIs — not amateur detectives and sleuths) and she will give you your top pick so long as no one has it already. Voting in the World’s Favorite Detective Tournament begins March 5 and will continue each week thereafter until the top detective is selected. Check out the list of 64 nominated detectives, but don’t worry Jen will provide you with links to information about them so you can choose wisely. And yes, there will be prizes. I hope you will join us in one form or another. As an aside, I’ve been scarce on the blogs since my cousin came to visit, but I’ll be making the rounds soon.